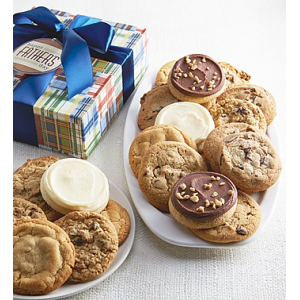 FATHER'S DAY COOKIE BOXES at $29.99. Our classically wrapped boxes arrive overflowing with a yummy assortment Dad is guaranteed to love! We've included salty caramel,vanilla buttercream frosted cut-outs,oatmeal raisin,chocolate chunk,our NEW peanut butter with peanuts and buttercream frosted banana split with peanuts. OU D.